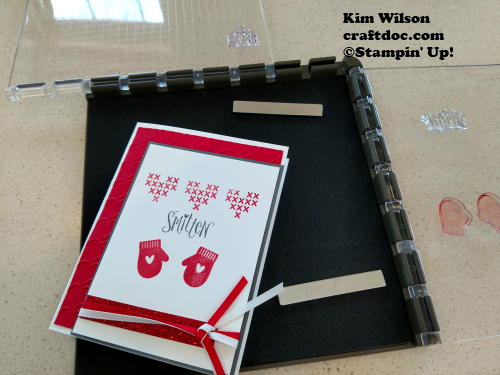 CRAFTDOC » The Stamparatus is Here! 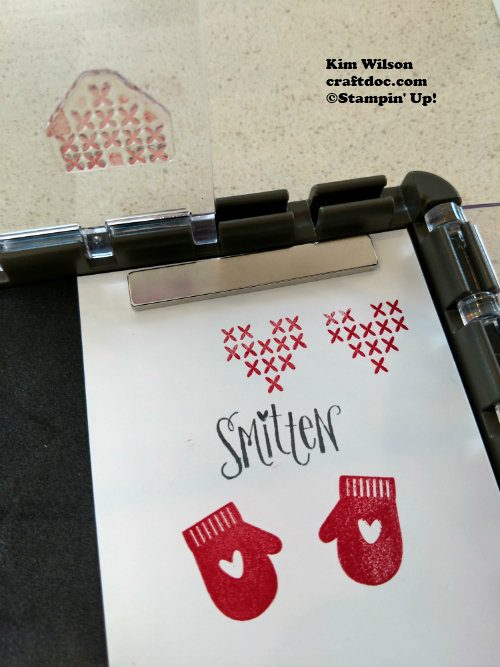 I am excited to be one of the first people to have the new Stampin’ Up stamp placement tool. 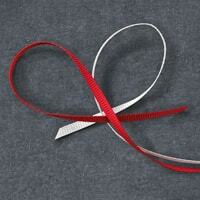 My history in the development of this fabulous tool and some FAQs can be seen in this post. 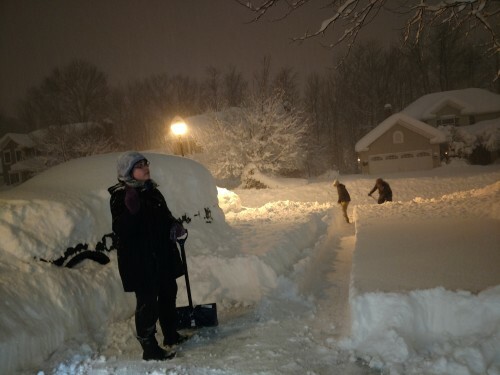 At my house, we are still digging out after a Christmas storm that has laid down over 5 feet of snow in 2 days. The good news is that my Stamparatus arrived before Christmas. We are in a snow emergency – so no mail, newspapers or UPS deliveries have been made since before Christmas. 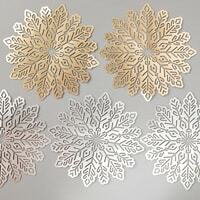 The bad news is that most of my free time has been spend shoveling, and my hands are too sore to do much stamping. 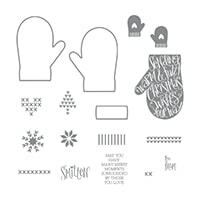 But I did get this card featuring the Smitten Mitten stamp set quickly made before the storm hit. How appropriate! My mittens have had a good workout this week. 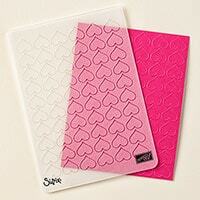 This stamp set is great for winter and Valentine’s Day. It is retiring soon and in low inventory, so you better grab it today if it is still available. There are darling matching dies as well. 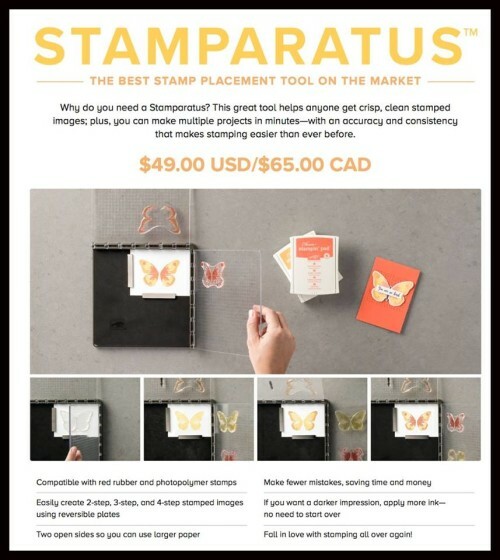 With the Stamparatus, you can align multiple stamps exactly where you want them. And if your image is not dark enough, you can ink and stamp again in perfect alignment. In the photo below you can see how the Stamparatus was key in getting the hearts in a line. Hinge jumping (moving down one notch at a time) is just one of the fun techniques you can do with your Stamparatus. Do you want your own Stamparatus? ***The reservation period is past. You will need to wait until June when the new Annual Catalog goes live. Be sure to subscribe to my newsletter to find out all the details!